Besides Christmas, my birthday is my second favorite holiday! I mean a full day dedicated to me? What's not to love. Birthday's are a big deal in my house and we always celebrate with a fun dinner, family time, and of course presents! So what's on my birthday wishlist? This was sort of hard to come up with. You see I'm turning... twenty.. four! Holy crap, I'm 24 and yet I still have the birthday wishlist of a 12-year-old. Not that I care, it's my birthday and I'll play with all the toys if I want to!! That being said, let's get to the fun part. One. Toy Story Vans // Ever since I saw these bad boys I knew that I needed my own pair. Now just pair these vans with a trip to Orlando for the Toy Story Land and you've got a friend in me indeed! Two. The Princess Diarist by Carrie Fisher // It's heartbreaking that our Princess Leia is gone. I would like nothing more but to learn more about her and her time on set. I swear I will finish this book in less than a day, and I'm totally okay with that. Three. Mary-Kate & Ashley Movies // Don't ask me why, but when I was a teen I sold all of my MK&A books and movies to McKay's but I totally regret it now. I'm slowly trying to build my collection back up. I'm missing a few movies though including this one, this one, this one, this one, and this one. Four. Donation to WWF // Not only is this a super cute gift with a certificate and everything, but it's a donation to a good cause. Plus, it's my favorite charity out there! Tigers and otters are my favorite animals, btw. Five. A Record Player // I've wanted one of these for a while but could never fit it into my budget. These things are so cute and just a perfect apartment decor piece. Plus, there are so many great records out there! I mean I want Fleetwood Mac, Disney, Lana Del Rey, Selena, Guardians Of The Galaxy, and of course CHRISTMAS records! Six. Gift Cards // I don't get to spoil myself often with iced coffees every mornings since I have to be an adult and pay bills and do adult things. However, if I get Krispy Kreme or Starbucks gift cards for my birthday that would totally change! Seven. Name Necklace // I know this is totally throwing it back to the 90's but I want a gold or rose gold name necklace. It literally goes with everything and would easily become a staple piece in my wardrobe. Let's be honest though, I've got bills to pay, so money is the best gift a gal can get! There you have it. 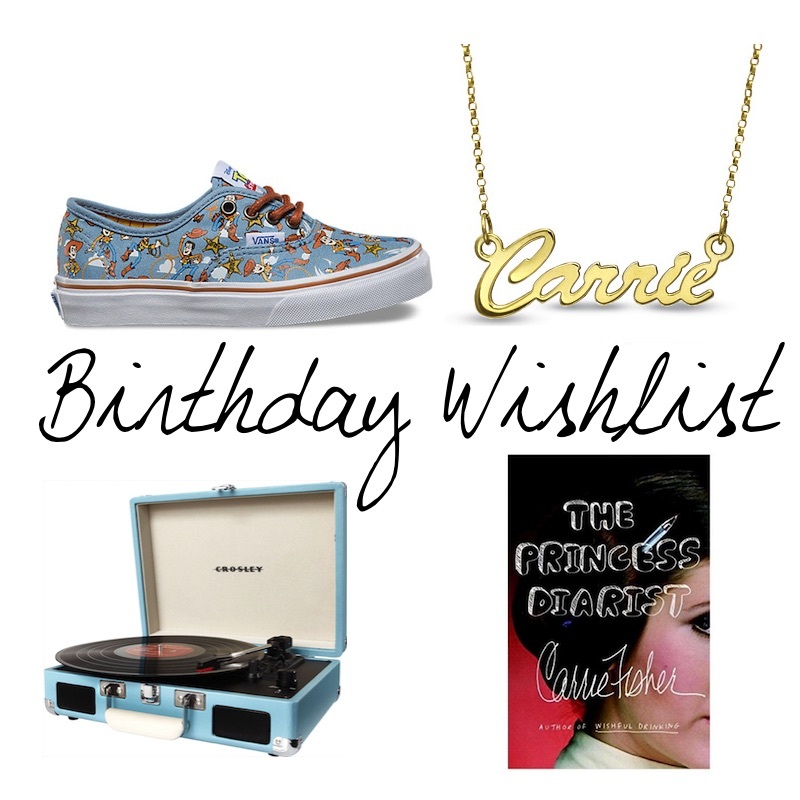 My grown up birthday wishlist! Okay, maybe it's not the most grown up, but it's a wishlist nonetheless. Cheers to 24!